It is important to keep your chimney clean and running efficiently. Pro-tech is the chimney sweep that can clean, repair and service your chimney and make sure that it is working properly. We are the only chimney sweep on Long Island that will ensure that your chimney and fireplace are in excellent working condition. If you are looking for experienced Long Island chimney cleaning company that can handle all of the chimney cleaning services and repairs for your Long Island home or business, contact Pro-Tech. There are not many chimney sweeps on Long Island that have the knowledge and experience that Pro-Tech Chimney Sweeps offers to their customers. 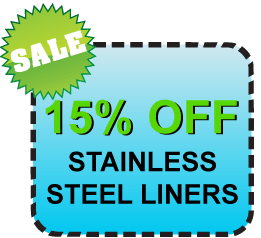 We are licensed and insured chimney cleaning business and we have many years of experience in the chimney cleaning, repair and service industry on Long Island. The National Fire Protection Association recommends that that you clean your chimney at least once a year or even more frequently if you have a fireplace or wood burning appliance that you use frequently. Long Island residents should hire a chimney sweep that can perform routine maintenance and chimney cleaning services at an affordable price. At Pro-tech, our chimney cleaning experts suggest that you have your chimney and fireplace serviced at least once a year. Twice a year chimney cleaning and maintenance is also suggested – schedule a service in the fall to prepare for the winter months and then in the spring to service and clean up after the cold winter when your chimney is working at its fullest capacity. Only the best chimney cleaning companies with the most experience will make these suggestions for your Long Island home. What type of service is recommended for a chimney? The Chimney Safety Institute of America recommends that “Chimney maintenance is best achieved through annual inspections, and mechanical sweeping, by trained professional chimney sweeps as frequently as needed. Chimney inspections often reveal hidden problems with a chimney structure that could be potentially hazardous. Mechanical sweeping of chimneys not only removes layers of creosote from the chimney surface, it removes the resulting loose soot and creosote from the chimney, fireplace, or wood stove.” A professional chimney sweep should be inspecting and cleaning your chimney at least once a year. An experienced chimney sweep will perform a full service that includes a professional inspection to make sure that your chimney system is working to its full capacity and that it is structurally sound. A proper chimney cleaning service should be performed by a certified technician that not only cleans your chimney, but also performs a thorough maintenance check to ensure safe and proper performance. In addition, proper care and maintenance of chimneys, woodstoves, and fireplaces can help protect your home from unnecessary fires and carbon monoxide poisonings. A professional chimney sweep should also be knowledgeable about building codes, trained to recognize any deterioration or venting problems and be able to advise you regarding any problems and the condition of your chimney. In addition to keeping your chimney clean and running efficiently, safety should always be an important consideration in the maintenance of your chimney. While chimney professionals can advise you regarding safety concerns, you should always take precautions and follow all safety regulations as an informed homeowner on Long Island. When should I call a chimney sweep? Call a reputable chimney cleaning company to give your chimney and fireplace a thorough cleaning. 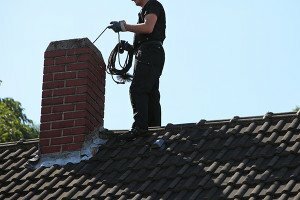 A professional chimney sweep should be licensed and insured and offer complete chimney cleaning services that include high powered vacuuming of your entire system, removing hazardous or combustible creosote, eliminating any accumulation of soot from coal and oil systems and thorough fire prevention inspections and maintenance services. What if I see cracks in my fireplace? It is important that you schedule routine maintenance for the chimney in your Long Island home, because an uncleaned chimney can be dangerous. The buildup of soot, dirt and chemicals can be flammable and hazardous. A chimney cleaning service is essential to your Long Island home. If you have a fireplace, every time you use it, a substance called creosite can build up. Creosite is highly flammable and becomes more difficult and expensive to clean, the longer it builds up inside the flue lining of the chimney. In addition, because it is highly combustible, if it builds up in sufficient quantities and the internal flue temperature is high enough, the unfortunate result could be a chimney fire. Routine maintenance services include the removal of any hazardous or combustible creosite and eliminating any accumulation of soot, dirt and debris. It is a fact that a clean chimney will work substantially more efficiently than a dirty one. An unclean chimney will not properly vent the smoke to the exterior of your home and can become dangerous. 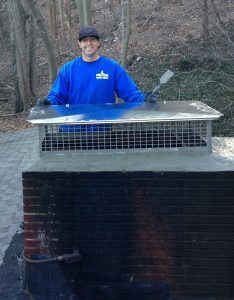 An experienced chimney sweep can perform a thorough chimney cleaning at your home on Long Island. Can a chimney sweep ensure that my chimney and fireplace are safe? Any experienced chimney sweep always has the safety of the homeowners at the top of their concerns. In addition to keeping your chimney clean and running efficiently, safety should always be an important consideration in the maintenance of your chimney. While chimney professionals can advise you regarding safety concerns, you should always take precautions and follow all safety regulations as an informed homeowner. Is it dangerous to have tree branches hanging over my chimney? Limbs or trees that are too close to the chimney can cause drafting issues and problems with your fireplace. A chimney blockage can create a dangerous situation in your home. An overgrown tree branch may block the top of your chimney, preventing smoke and carcinogens from exiting the house. Smoke and gases that build up within the home can produce carbon monoxide. This deadly and odorless gas can accumulate to dangerous levels when a blocked chimney or flue prevents the gases from properly venting out and away from the home. A falling branch or tree limb may damage your chimney causing cracks in the structure or bricks to fall off or decay. A damaged chimney will not properly vent smoke and gas which can also cause carbon monoxide to build up within your home. In addition to harboring harmful gases, a damaged chimney can be costly to repair. The best way to protect your chimney and your home is to trim or prune any branches that are too close to your home or hanging over your roof or chimney. If a chimney sweep detects a blockage problem, be sure to have it addressed. Can a chimney sweep install a chimney cap on my chimney? Yes. A chimney cap can prevent animals from entering your home, keep the moisture out, and protect the roof from burning embers starting a house fire. Installing a simple chimney cap with mesh siding will prevent any animals from climbing in. In addition to keeping animals out a chimney cap can also protect your chimney from moisture from snow or rain. You should also have your chimney inspected, cleaned and properly serviced at least once a year. 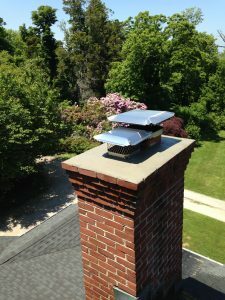 If you are interested in a quality chimney cap installation, contact Pro-Tech Chimney Sweeps at 631-806-8550. How do I find an experienced chimney sweep or chimney Cleaning? For an experienced, knowledgeable and reputable chimney cleaning company and certified chimney sweep on Long Island, contact Pro-Tech. They are licensed and insured and offer complete chimney cleaning services that include high powered vacuuming of your entire system, removing hazardous or combustible creosote, eliminating any accumulation of soot from coal and oil systems and thorough fire prevention inspections and maintenance services. Contact Pro-tech Chimney Sweeps at 631-806-8550 to schedule a quality chimney cleaning, inspection and cleaning service today. They are licensed and insured and offer complete chimney cleaning services. Give them a call at 631-806-8550 to schedule a chimney cleaning, inspection or maintenance service today.